Whenever a new person comes to our shop or meets us at an event, we hand that person an origami butterfly with the phrase "If nothing ever changed, there wouldn't be butterflies." Change is constant yet people, more often than not, fear and try to avoid change. Without going into details, our team here at Reach And Teach is looking at some potential changes and we're both anxious and excited about the possibilities. Fortunately, there are people in our lives who are standing tall, nurturing and guiding us, and letting us know that they are there for us through whatever changes may come. We recently heard from Janet Lucy, the author of The Three Sunflowers, wondering if we might want to take a look at her book. With our mission of Transforming the World Through Teachable Moments, we know that every time someone opens a book, transformation may soon occur. That's the case with this book. Beyond the absolutely beautiful softly and gently rendered watercolor illustrations and lyrical and engaging writing style, the story of the sunflowers in the garden is very compelling and grabs you from the very first page. "Dawn awoke early one morning washing the Summer sky in fresh new shades of pink, orange, and lavender." We then go through the entire day among the three sunflowers, learning about what is, what was, and what will be, from Gloria, Solita, and Sunny. Things change, from moment to moment, hour to hour, and day to day. Sometimes, even for just a moment, everything is perfect. How wonderful to be in the moment and enjoy that perfection. When storm clouds gather, we have to gather up our strength to weather that storm. It's OK to be afraid, but hold on tightly and have faith that the storm will end. And... even if it doesn't, remember that the cycle of life goes on. This book can be a terrific launching point for discussions about so many topics including the entire circle of life, the reality of death, and even how to deal with bullying. When a Cooper's Hawk swoops through the garden scaring the little birds away, what can the sunflowers do? Stand tall! Be a stable and calming presence in the midst of chaos. In anti-bullying lessons children are encouraged to become "upstanders" instead of "bystanders." Imagine asking a child what he or she could do when other children are being bullied, thinking about the sunflowers and how they stood tall, and how a child can add one more element to the situation, the power of his or her voice saying "stop!" In the midst of change, this book landed on our doorstep at just the right moment. And just moments ago someone wandered into our shop and said "I've been thinking about you guys and I was wondering......." Good thing we believe that change can be a good thing, because without it there wouldn't be any butterflies, or wonderful books! 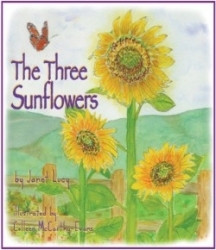 The Three Sunflowers tells of a turbulent day in the garden where a trio of sunflowers -- the tall, wise Gloria and young Solita and Sunny -- face unexpected and chaotic events they have no power to stop. Through it all, Gloria guides and reassures the youngsters and reminds them of the purpose of a sunflower’s life. After a dark night of uncertainty, the story concludes with a delightful surprise ending. This unique and inspiring book offers empowering messages of hope, courage and peace, with new perspectives for living in an unpredictable world. Janet Lucy, MA, is an award-winning writer and poet, and the author of Moon Mother, Moon Daughter ~ Myths and Rituals that Celebrate a Girl’s Coming of Age. Janet is the Director of Women’s Creative Network in Santa Barbara, California, where she is a teacher, counselor/consultant, and the mother of two radiant daughters. Colleen McCarthy-Evans is a watercolorist, writer, and award-winning inventor of board games for children and families. She’s a co-founder of The Santa Barbara Charter School in Santa Barbara, California, where she lives with her husband and dog, and enjoys being in and out of the garden with her two grown sons.